(11/29/2012) Toko Bagus.Com, one of the biggest online shopping websites in Indonesia, supports ProFauna Indonesia working on wildlife conservation in the country by not displaying the illegal wildlife trade on its website. Toko Bagus expressed its commitment during the meeting with ProFauna Jakarta held on 28th November 2012 in Jakarta. It was attended by Toko Bagus' public relations manager, Ihwan Sitorus; event organizer, Ario Agung S; and quality content, Alif. Other NGOs coming to the meeting were the Wildlife Conservation Society and Burung Indonesia. According to ProFauna's records between January and October 2012, there were 35 offers of protected wildlife displayed on the website. The protected species were: Javan langur (Trachipithecus auratus), Javan gibbon (Hylobates moloch), and slow loris (Nycticebus sp) offered for from 250,000 IDR to 4 millions IDR each. The sellers admitted coming from Jakarta, Tangerang, Bogor, Surabaya, Yogyakarta, Malang, and Padang. The rampant online illegal wildlife trade urges ProFauna to demand Toko Bagus to block the offers selling protected wildlife. Toko Bagus showed positive feedback because one of its main principles was a clean and healthy online shopping website. In the future, Toko Bagus would work together with ProFauna to make sure that the animals being offered were not protected by law. Irma Hermawati SH, coordinator of ProFauna Jakarta representative stated, "We applaud Toko Bagus for its commitment to help us reduce the illegal wildlife trade which threats the survival of wildlife". 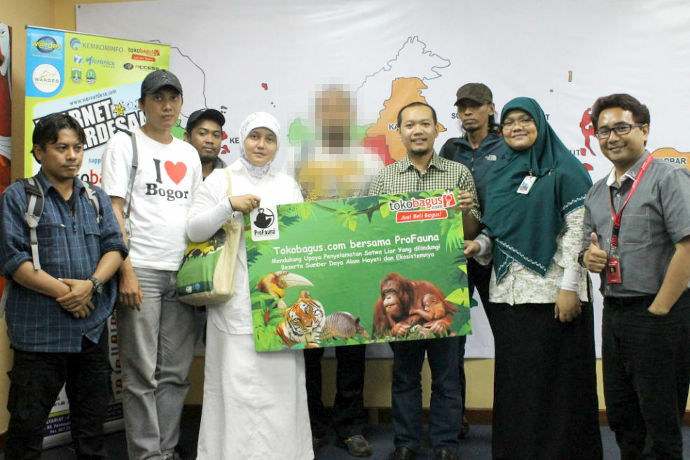 Hermawati added, "We hope that other online shopping websites will follow Toko Bagus not to display offers selling protected wildlife because the trade of the protected wildlife violates the law." According to the Law number 5 year 1990 concerning the Conservation of the Natural Resources and the Ecosystem, the trade of the protected species is prohibited and offenders are liable to a maximum of five-year prison term and a maximum of 100-million IDR fine. Chairman of ProFauna Indonesia, Rosek Nursahid, added, "The illegal wildlife trade both in traditional and online ways are crime. Together we must fight against the trade". Since there are still practices of online trade, ProFauna will launch an online report of the online illegal wildlife trade.